Article by Antonia Laurence-Allen and Helen Whiting. 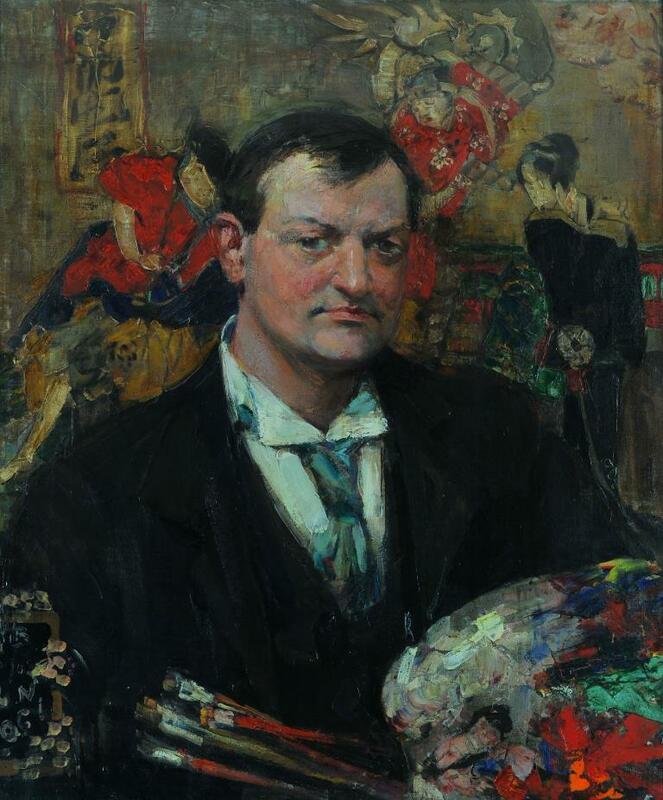 Writing on Edward Atkinson Hornel (1864-1933) has largely focused on how his rise to fame and profitability stemmed from his use of Japonisme; a ‘western’ take on Japanese art and culture. Building on this work, this article argues that it was Japanese photography, encountered on a trip to Japan in 1893, rather than Japonisme itself that provided Hornel with a new way of looking. Japanese art was greatly admired by European artists in the mid/late 1800s and its influence can be seen in the works of painters like James Abbot Macneil Whistler (1834-1903), Edouard Manet (1832-1883) and Mary Cassatt (1844-1926). By 1872, the European art market was claiming the birth of a new style, ‘Japonisme’, adopted enthusiastically by avant garde artists who were seeking a new language for painting. Hornel emerged from art school into this atmosphere and became actively involved in the avant-garde art scene in Glasgow. Japonisme paintings were being brought to the city as well as exhibitions of costume and ‘curios’, all designed to pique the public’s imagination (fig.1). Hornel was therefore not alone in his desire to explore and use the ‘exotic’ qualities of this newly ‘discovered’ culture. He, and his friend and fellow artist George Henry (1858-1943), set off for Japan in 1893, stating his ‘desire to see and study the environment…to become personally in touch with the people, to live their life, and discover the source of their inspiration.’ Whether Hornel did indeed experience Japan this way is questionable, but what he did bring home was a greater understanding of how to use the camera. Hornel had definitely been taking photographs before he went to Japan. 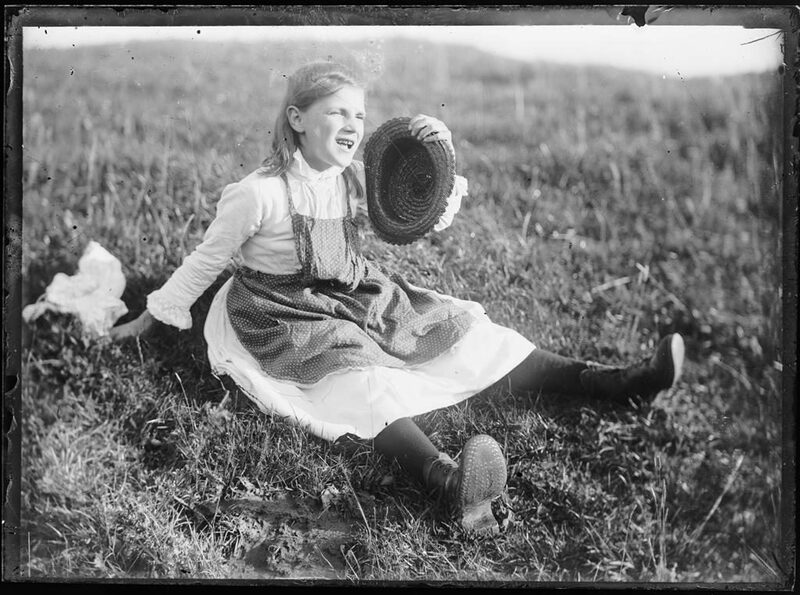 For example, there is a glass plate negative that captures a young girl with hob-nailed boots, sitting on the grass grinning widely (fig.2); she is the same figure seen in Hornel’s 1891 painting Summer. Hornel was also aware that other fellow painters in Scotland, like John Lavery, A. E. Taylor and James Paterson were also using photographs to aid their work. In setting the scene, we can therefore appreciate that Hornel was a painter happy to utilise the camera. What is more interesting is what he learned from his engagement with the visual aesthetic of Japanese photographers. Japan had been a closed book to most Europeans, but this was changing by the time of Hornel’s visit. In 1868, a political revolution had occurred, which brought about the demise of the military government and the return of imperial rule. The Emperor took the name Meiji, meaning ‘enlightened rule’, and a shift began from a feudal society towards a more westernised government. The changes included hiring foreigners from specialist fields, such as engineering and telecommunications, to lead infrastructure projects and train a new generation of Japanese students in modern technology, as well as sending Japanese citizens to Western Europe and America to learn the latest innovations. Key figures in our story on photography embarked on this program of exchange. William Burton (1856-1899) was hired as a civil engineer for the Imperial University in the late 1880s. He was also a keen photographer and met Ogawa Kazumasa (1860 – 1929), a professional photographer and pioneering printer who had undertaken a two-year apprenticeship in Boston learning skills like dry plate developing and collotype printing. Burton and Kazumasa were founding members of the Japanese Photographic Society (JPS) and close colleagues. In 1891 an exhibition of Kazumasa’s photographs helped launch the opening of Japan’s first skyscraper, the Ryounkaku, which had been designed by Burton. The display was a publicity stunt that also helped raise Kazumasa’s profile as a photographer. Entitled 100 Beauties, the exhibition contained a collection of studied portraits of Tokyo’s geisha girls; visitors were asked to climb the tower and vote for the most beautiful woman. The first photographs of Japan were taken in the 1850s. As a rapidly developing technology, the camera was very much part of the modern world and Japanese photographers recorded infrastructure projects, building works and contemporary life (including, the Emperor depicted in modern dress). Concurrently, studios started catering to western markets and fed audiences with the well established image of Japan as ‘a land of quaintly beautiful women and flowers and fans and sunshades’. Figure 3 is an example of the kind of composition that sold well. Known locally as shashin and highly valued for their colours, detail and design, these photographs focused on Japanese tradition, costume and feudal customs. In this image, a woman is photographed in front of a generic studio backdrop. She wears a patterned kimono. 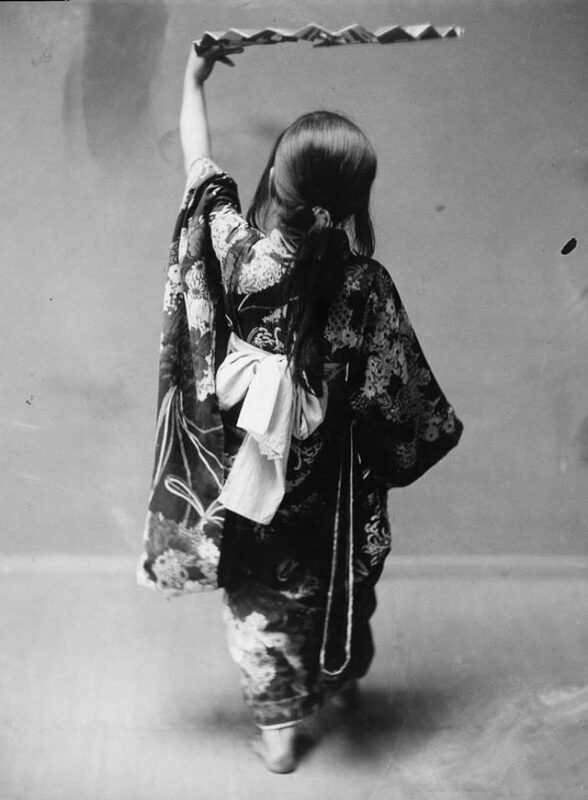 Her arms, raised above her head, hold a traditional Japanese hat (kasa). This gesture provides an excellent view of the wide sleeves of the kimono and a glimpse of the obi knot at her back. Her pose, head titled forward and body twisted to be viewed three-quarters side on with knees slightly bent, creates a perfect ‘S’ bend. This is echoed in the shape created by her left forearm and sleeve and is partially repeated by the ribbon of the kasa. It is a deceptively complex construction of shapes and reflects the asymmetrical and vertical aspect of the compositions found in most of the shashin in Hornel’s collection (Figs. 4 + 5). Many commercial photographers were members of the JPS; Japan’s first photo society. In its founding year (1889) the JPS had fifty-six members, including Burton and Kazumasa. Nearly half of the memberships (twenty-four) were foreigners and the organisation became a vital social centre for tourists. Hornel and Henry both became members in 1893. The JPS helped outsiders meet local people and gain access to theatres, exhibitions and modelling sessions. Members went to local theatres and tea-houses to watch dancers perform. They were also given the chance to capture women in traditional costume posing in the privacy of a studio setting. 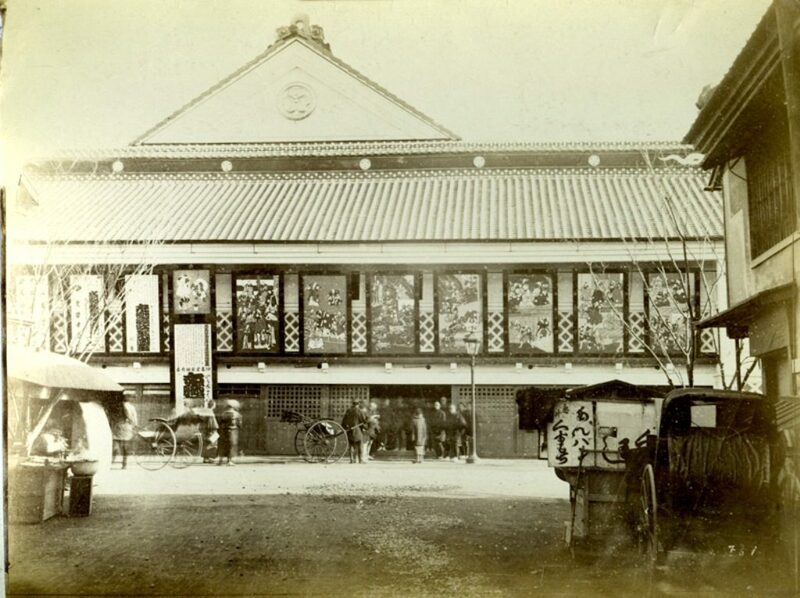 Hornel had taken advantage of the activities and modelling sessions organised by the JPS; even buying a local photograph of Tokyo’s main Kabuki theatre as a memento (fig. 6). 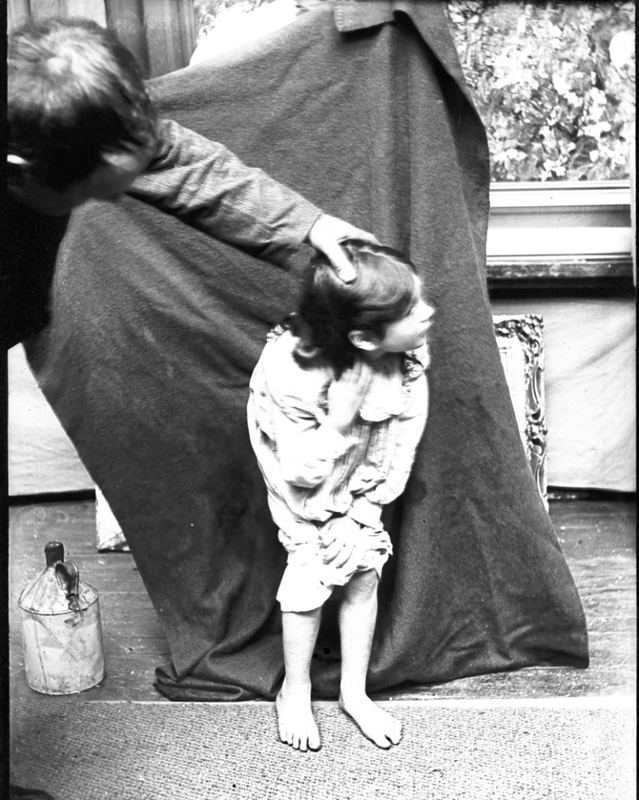 In the collection at Broughton House (Hornel’s Kirkcudbright home) there are a number of glass plate negatives of Japanese girls and women, all focusing on specific actions and expressions (Figs. 7 + 8). 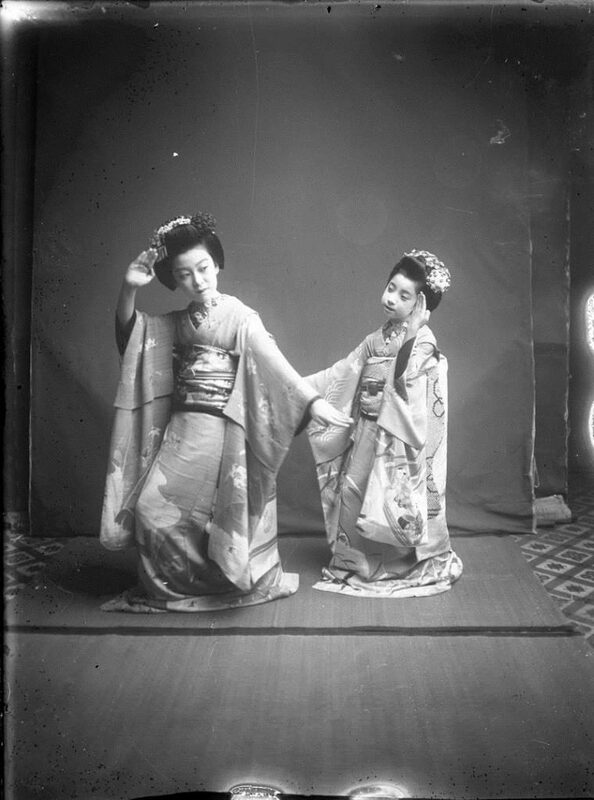 He was fascinated by the gestures and movement of Japanese dance, which, he said was ‘made up of quaint posturing, dignified and refined movements, with delicate and artistic and pretty manipulations of the fan.’ As a westerner, Hornel valued Japanese culture from his own domestic lens. This colonial attitude has been explored in detail by scholars and is not the direct focus of this article. Instead, we focus on what forms Hornel sees; namely, the unique postures, gestures and movements of the hands, head and body. Hornel re-visited japan in 1920 and the Broughton House collection contains three sets of images gathered on both these trips. First, he purchased a large quantity of shashin showing women, interiors and landscape scenes (fig. 9). 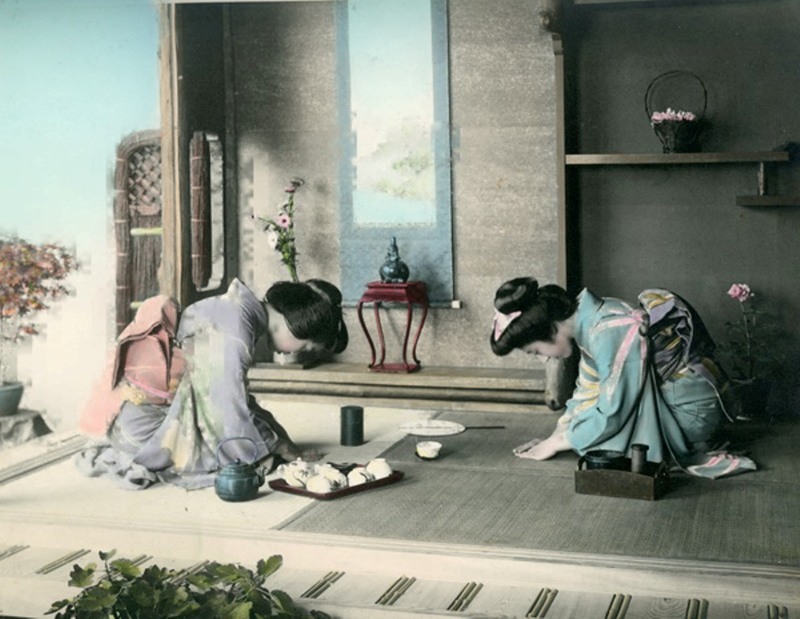 The shashin gave Hornel a set of static, formulaic poses, depicting women and girls tending a tea ceremony or standing in a Japanese garden. Many of these were taken by JPS members known to Hornel (including Kazumasa and Kōzaburō Tamamura) and removed the obedient and submissive ‘ideal’ Japanese woman from modern life, placing in a fantasy world created by western exoticism (fig.10 + 11). Both Kasumasa and Tamamura fed the market with images reinforcing the stereotype of Japan as a land of cherry blossom and geishas. Many of these images have been jabbed through with a pin or splashed with paint as Hornel presumably used them for reference while he painted in his studio (fig. 12). The second type of image in Hornel’s Japanese collection is the result of studio modelling sessions organised by the JPS (figs. 7+ 8, 13 + 14). 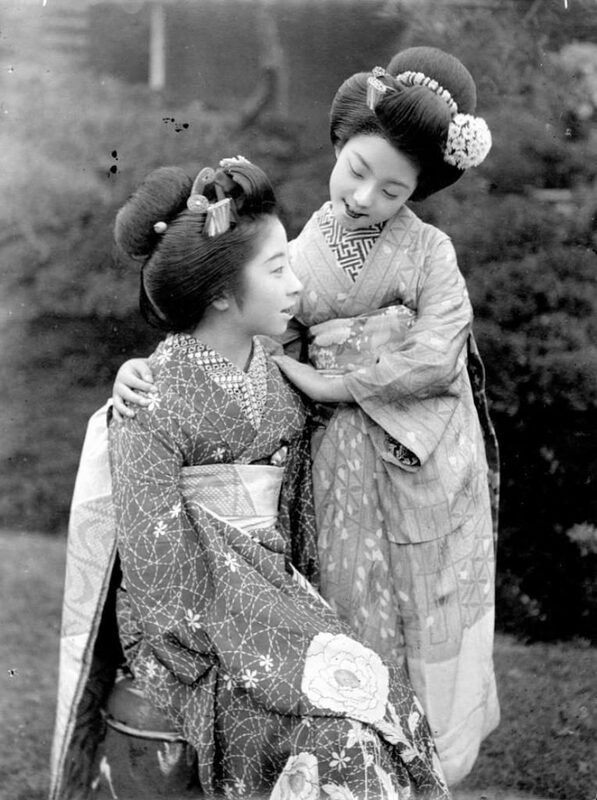 These are attributed to Hornel, but, may have been taken by another photographer as he was sent images of two Japanese women in 1920. The glass plate negatives capture women and girls posing informally in a basic studio setting with the ubiquitous and highly incongruous matting and backdrop. Their bodies are more languid than the static figures in the hand-coloured shashin. In what seems like an effort to extend the traditional poses found in commercial photography, these studio photographs provide the expression and dynamism Hornel had been captivated by when he attended the dance halls and theatres. These are similar to the third set of images, which capture women in informal poses but are highly structured (figs. 15 + 16). Groups of girls laugh with one another and single women engage with the camera in a confident manner. They are posed with an ease that is not evident in the formal shashin and are more sophisticated than those attributed to Hornel.. It is not known if these were taken by JPS members for private use or whether they were available commercially. It is evident that the entire collection had a profound effect on both Hornel’s paintings. After his return to Scotland in 1894, Hornel’s honed an approach to painting that always seemed to begin with a photographic image. After his first exhibition of Japanese paintings was sensationally successful he developed a method of manufacturing works that would sell. All his subsequent paintings focused on the twists and turns of the female form. The hands, feet and bodies all reflect the studied poses seen in the Japanese prints he collected. And, all the figures are enshrined in scenes of dreamy colour and light; an imaginary rural setting unreflective of modern realities (fig. 17). Hornel purchased Broughton House in Kirkcudbright in 1901, which had a large studio adjoined to the back. This is where he started using photography to capture the choreographed poses he would transfer into paint. His eldest sister Tizzy became his housekeeper. Local girls, chaperoned by the mothers and guided in the studio by Tizzy, began posing for Hornel’s camera. 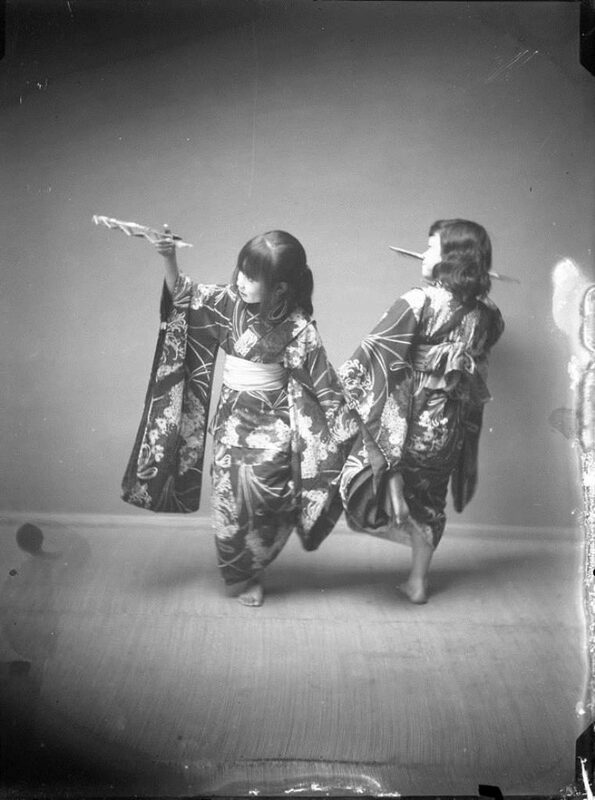 A friend, Robert McConchie, helped with the photography and Hornel directed the girls to move and stand in particular ways; ways that reflect the specific poses of the Japanese dancers (fig. 18). At this point, Hornel becomes a compositor, taking a hand from one photograph, a tilt of the head from another, then applying a broad hard outline and detailed attention to skin tone on the faces of the figures in his paintings (fig. 19 – 21). It is not the identity of an individual he seeks to interpret but the ideal surface of the female form; a purely objective exercise to find the ‘ideal’ pose. The girls are then surrounded by an increasingly frenzied thick impasto, suggesting a setting, perhaps a tree, a bay or a flowering shrub. In the first two decades of the 1900s, Hornel was to create over 1,600 glass plates. The largest selection is of local girls, but there are also a number of photographs from Hornel and Tizzy’s 1907 trip to Ceylon and 1920 visit to Burma (figs. 22 + 23). They all echo the tropes he had discovered in the Japanese commercial photographs. Photography is inherently paradoxical, as it is a modern technology used to capture the essence of the past. 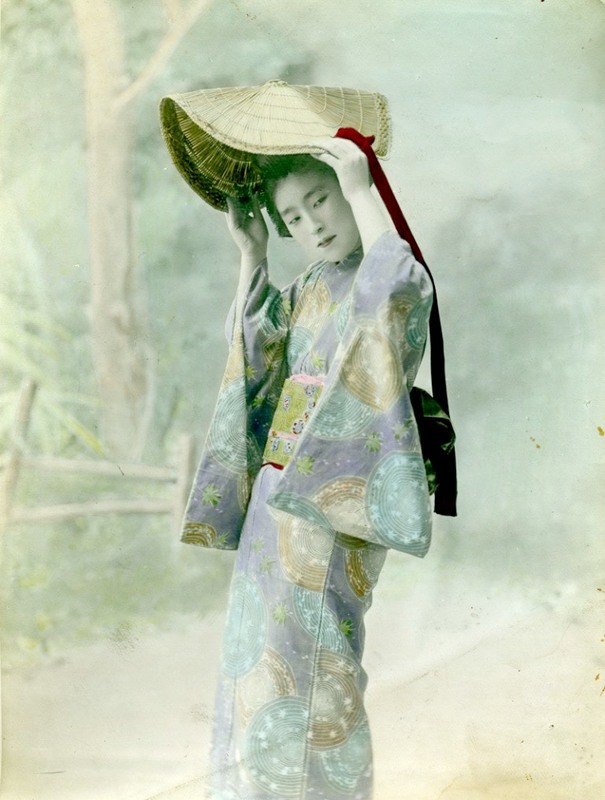 In Japan, many photographs were taken to record the country’s period of change, but the vast majority of photographic prints focused on ancient feudal customs, ‘exotic’ habits and traditional costumes, as these were popular with nostalgic, curious, western tourists. 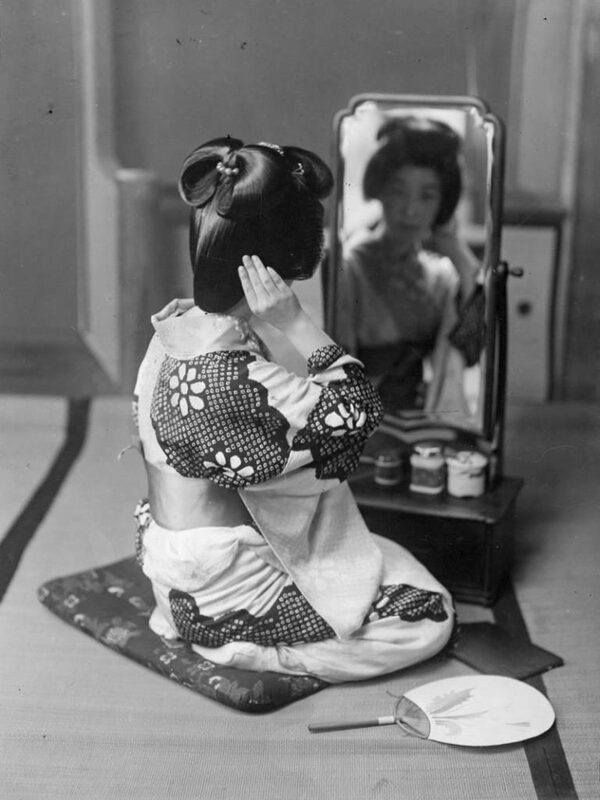 Japanese photographers were feeding this market, milking the audiences of their fetish for feudal and female idealism. 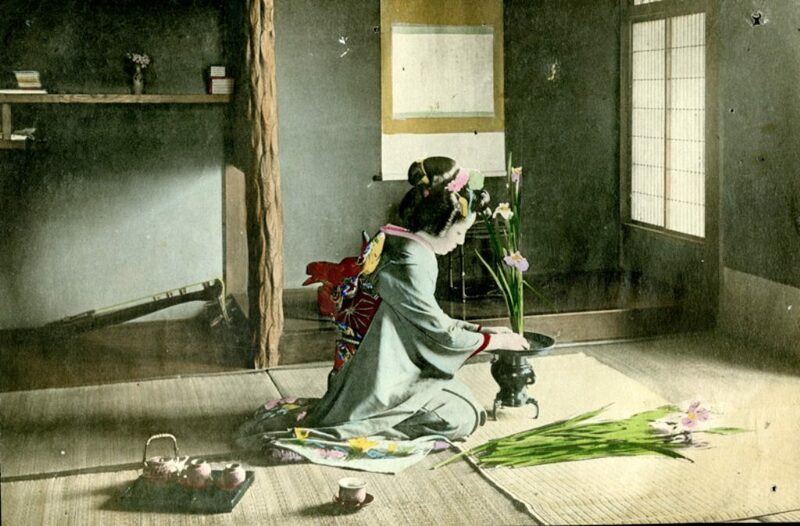 Hornel was hoping to find a pre-industrial idyll in Japan, as he himself said: ‘a paradise of babies and pretty girls, a land of cherry blossom and seductive tea house life’. However, he was disappointed with the contemporary country he encountered in 1893. Ironically, it was the modern technology of photography that gave him the ideal world he longed to witness, and to paint. The main sources on Hornel are: Bill Smith. The Life and Work of Edward Atkinson Hornel. Edinburgh: Atelier Books. 1997. Ayako Ono. Japonisme in Britain: Whistler, Menpes, Henry, Hornel and Nineteenth Century Japan. London and New York: Routledge Curzon, 2003. Their trip was sponsored by Alexander Reid and was to result in a large exhibition. Many of Henry’s paintings were destroyed in a fire, but Hornel exhibited many works and sold them all. Summer (1891) is in the collection of the Walker Art Gallery, Liverpool. John Lavery. The Life of a Painter. London, 1940. 42. Roger Billcliffe, The Glasgow Boys. London, 1985. 164. For more on this see: Alex D. D. Craik. ‘Science and technology in 19th century Japan: The Scottish connection’. Fluid Dynamics Research. 39, No. 1–3, (January–March 2007): 24–48. Born in Saitama, Ogawa Kazumasa had studied English and photography before moving to Tokyo aged 20 and was hired as an interpreter for the Yokohama Police Department. Two years later, in 1882, Ogawa took a trip to Boston where he worked on becoming a professional photographer. After nearly two years in the US, Kazumasa opened the first commercial photographic studio in Tokyo. Soon after, he established a dry-plate manufacturing company and Japan’s first collotype business. For further information about the 100 Beauties see: Julie Nelson Davis. Utamaro and the Spectacle of Beauty. London: Reaktion Books, 2007. For more information in this area see: Rousmaniere, Nicole Coolidge, and Mikiko Hirayama, (eds.) 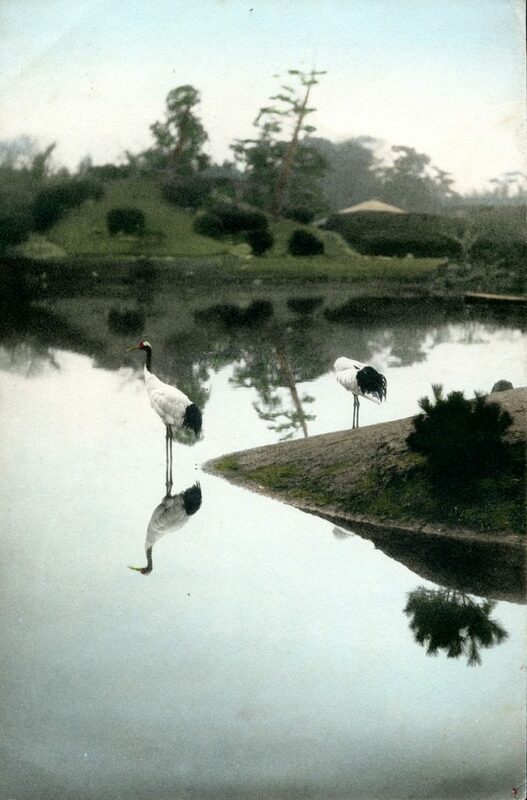 Reflecting Truth: Japanese Photography in the Nineteenth Century. Amsterdam: Hotei Publishing, 2004. Anne Tucker, The History of Japanese Photography. Houston: Museum of Fine arts and New Haven: Yale University Press, 2003. Quote from: Glasgow Herald. 4th May 1895, issue 107. 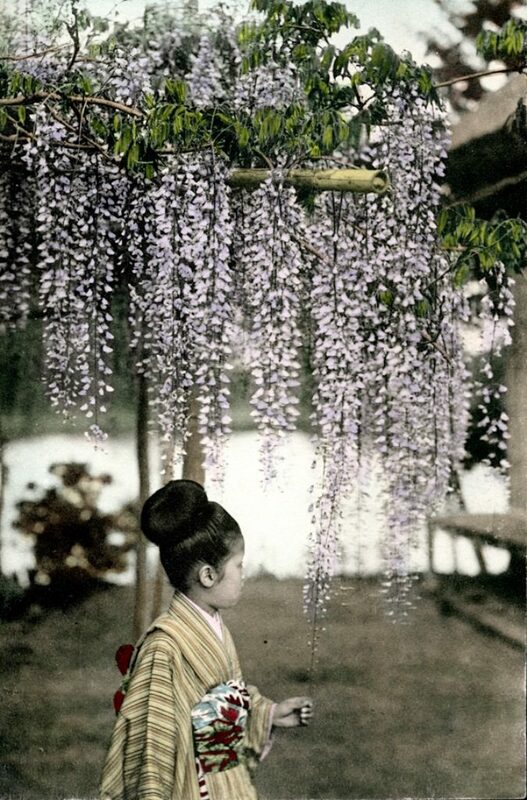 The commercial photographers extended a Japanese tradition that stems from the 17th century. Bijinga or ‘Pictures of Beauties’ became a popular subject matter for artists and patrons (particularly the growing middle classes) and were produced largely as woodblock prints. These showed elegant and beautiful women, with their clothing and hair meticulously recorded, undertaking refined leisure activities. Kitagawa Utamaro (c.1753 – 1806) was one of the most highly regarded practitioners of this genre. His work was fashionable with Western collectors in the 19th century. His prints series included: Ten Types of Women’s Physiognomies (1792–1793); Famous Beauties of Edo (1792–1793); Ten Learned Studies of Women (1792–1793); Array of Supreme Beauties of the Present Day (1794); Flourishing Beauties of the Present Day (1795–1797); Ten Forms of Feminine Physiognomy (1802). Note for lecture delivered by John Keppie (on behalf of Hornel) at the Corporation Galleries Glasgow, 9/2/1895. Broughton House archives. Edward Said. Orientalism. New York: Vintage, 1979. Ali Behdad. Belated Travellers: Orientalism in the Age of Colonial Dissolution. Durham, NC and London, UK: Duke University Press, 1994. James Ryan. Picturing Empire: Photography and the Visualisation of the British Empire. London: Reaktion, 1997. Eleanor M. Hight and Gary D. Sampson (eds.) Colonialist Photography: Imag(in)ing Race and Place. London and NY: Routledge, 2013. When Western artists/producers entered this field they added to the objectification process: not only were the women objects to be gazed on for their beauty and femininity but for their exotic appeal. 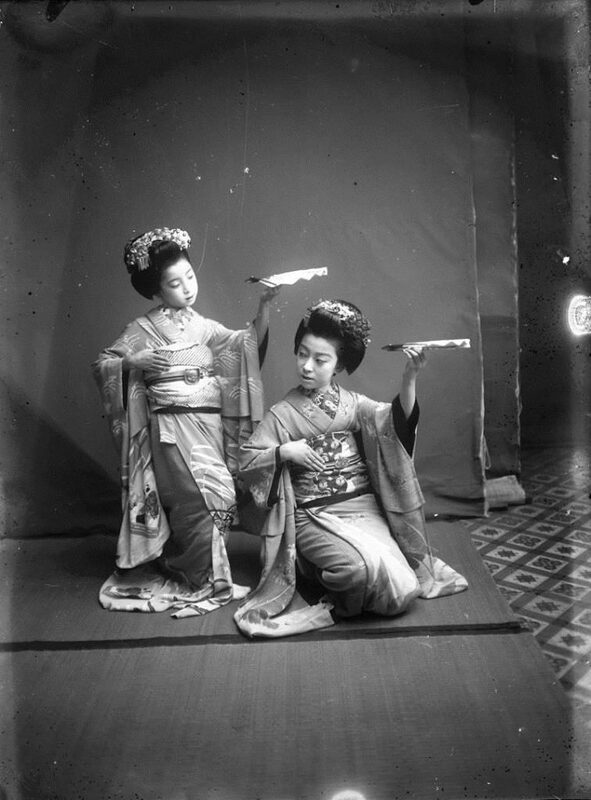 Felice Beato, a Venetian born photographer, based in Yokohama in the 1860s was one of the first to use the produce commercial prints of Japanese women posed in costumes and staged in non-western settings. Beato’s images removed the ‘ideal’ Japanese woman from modern life, placing her firmly in the past and in a fantasy world created by western exoticism. For more information on this see: Eleanor M. Hight, ‘‘The Many Lives of Beato’s “Beauties”,’ in Hight and Sampson (eds.) Colonialist Photography: 126-158. 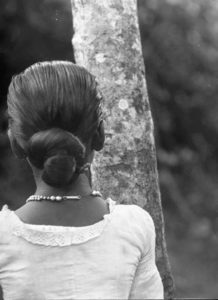 In Ceylon, some glass plates seem to have been taken by Hornel’s cousin James Hornel, who worked as a government Marine biologist in Columbo. 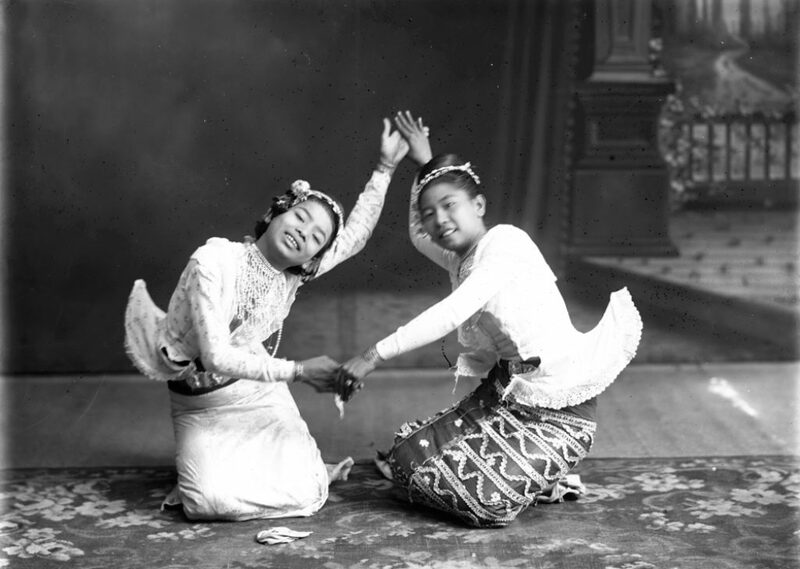 In Burma, Hornel was ‘supplied’ with dancing girls by a local photographer, so he could capture their movements to use in future paintings. In a letter to a friend, Hornel notes that he was sent a ‘fine and useful set’ of photographs of the ‘two very handsome and magnificently clothed females’ by the ‘Photoman’ (who is not identified). The letter is held in the archives of the Hornel Trust at Broughton House. Quoted in Smith. 121. For more on this on a wider cultural level see: Karen M. Fraser. ‘Beauty Battle: Politics and Portraiture in Late Meiji Japan.’ In, Wong, Yuen Aida (ed.) Visualizing Beauty: Gender and Ideology in Modern East Asia Hong Kong: Hong Kong University Press, 2012. 11-22. Note for lecture delivered by John Keppie. Antonia Laurence-Allen is a curator at the National Trust for Scotland, responsible for the photographic collections and properties including Kellie Castle, Canna House and Robert Smail’s Printing Works. She has over twenty years experience in education, interpretation and curatorial work across North America, Canada and Scotland. With a PhD in the history of photography, Antonia’s main area of research focuses on commercial photography in Victorian Scotland. Nel Whiting is undertaking an AHRC funded inter-disciplinary PhD at the University of Dundee. She is using Scottish family group portraits from the second half of the eighteenth century along with archival sources to investigate gendered constructions of national and familial identity. She was awarded the Leah Leneman Essay Prize 2010 by Women’s History Scotland for new writing in Scottish gender history and is author of ‘Gender and national identity in David Allan’s ‘small, Domestic and conversation’ paintings’ and ‘Depictions of Childhood in David Allan’s Family Group Portraiture’ in Childhood and Youth in Pre-industrial Scotland .